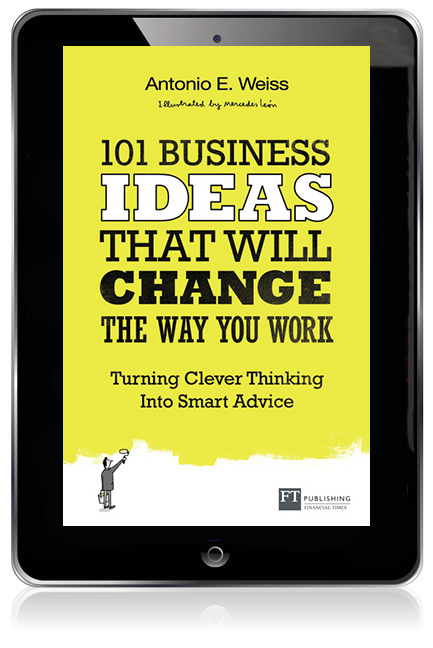 101 Business Ideas That Will Change The Way You Work takes fascinating findings from world-class business research and shows you how to become cannier and more effective at work. This illuminating book not only tells you what you need to know to stay one step ahead, but why you need it and how to do it. IDEA #11: How good do you think you are? IDEA #18: Why we’re anchored to what we know.. IDEA #26: Why being boring can make you a brilliant CEO.. IDEA #31: To opt in, or to opt out? IDEA #35: The two yous. IDEA #36: Work stress? Go for a run. IDEA #54: Working on an acquisition? Seller, beware! IDEA #63: Do you have a Pareto or a long tail? IDEA #68: Do I have a choice? IDEA #87: Working from home or shirking from home? IDEA #93: Is your office making you sick? IDEA #96: Need to manage a negative rumour? Challenge its credibility. Antonio E. Weiss is a writer and management consultant. His previous book, Key Business Solutions, also published by Financial Times Press, was shortlisted for the Chartered Management Institute Book of the Year Award 2013, featured as a WHSmith Business Bestseller, and has been translated into several languages across the globe. He also writes regularly for publications such as theGuardian and Prospect, presents at conferences on economic, business and political issues, and has been featured on international media including ABC Radio Australia and BBC Radio 4. As a consultant, he has advised leading public and private sector bodies on major strategy, capability building and performance improvement issues. Antonio is also a board member of one of the largest Further Education colleges in London. He holds a Bachelor’s degree (First Class) and Master’s degree (Distinction) in History from the University of Cambridge.